After lying frozen for 10,000 years, a bison mommy will reveal its secrets with an extremely well-preserved state, new discovery promises. The Yakagir tribe in northern Siberia discovered in 2011 the body of a steppe bison (Bison priscus), an ancestor of the modern bison which still populates the plains of North America and northern Europe. After transporting the perfectly preserved bison to the Yakutian Academy of Sciences in Siberia, researchers planned a rigorous autopsy of the animal. 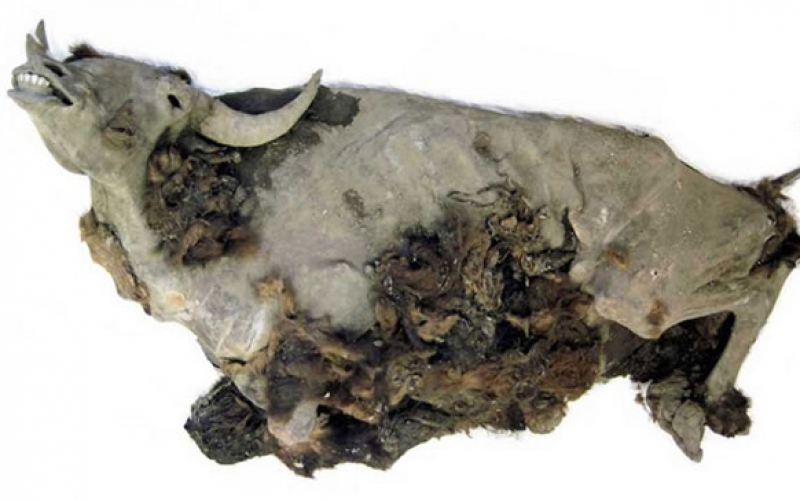 Many other steppe bison mummies have been discovered throughout the years, but this is the very first to display such a well-preserved state, deserving the title of Yukag, bison mummies. At the time of its discovery, it had all its internal organs almost completely intact, says Olga Potapova, curator of the collections and manager at the Mammoth Site of Hot Springs in South Dakota, who helped study the ancient mammal. "Normally, what you find with the mummies of megafauna in North America or Siberia is partial carcasses. They’re partly eaten or destroyed because they’re lying in the permafrost for tens of thousands of years," Potapova said in an interview with LiveScience. "But the mummy was preserved so well that it [earned] a record for the level of its preservation." Researchers believe that Yukagir bison died young, no older than about 4 years old, said Potapova. The claim is based on the lack of fat around the bison’s abdomen, which suggests the bison starved to death. Except for the lack of fat layer, the bison was in perfect shape, with heart, blood vessels, and entire digestive system almost intact. Some of the organs however, shrunk significantly, according to scientific opinion. So well-preserved was the specimen that scientist found a tissue sample from each organ, Potapova continued. Consistent with the rest of the organs, bison’s brain was also extremely well-preserved. Researchers plan to use the samples extracted to collect data about the prehistoric bison and then compare it to modern bison species, said Natalia Serduk, a senior researcher at the Russian Academy of Sciences in Moscow.